Video monitors are not a new thing anymore. They have been around for some time and their technological improvements are taking place at great pace. However, there is no baby monitor as versatile, feature-rich and user friendly as Infant Optics DXR-8 video baby monitor. Talk about battery, video quality, portability, ease of use and future proof elements, this device will not disappoint you in any of those areas. It looks great, it has a sturdy design and expandability is not a problem with this amazing video baby monitor. 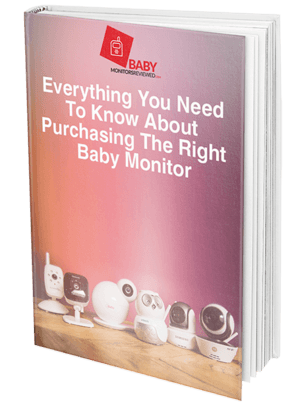 Just like most baby monitors, the whole system comprises of a parent unit and a baby-monitoring unit. To keep up with the requirement of modern users, the whole system runs on a wireless network, allowing you to keep your house free of cables and wires. There is no doubt that the interchangeable lens feature is something that makes this baby monitor one of a kind on the market. You rarely ever find this option on other baby monitors. You might want to abstain from calling this feature gimmicky because it really has a useful purpose. ​Battery Timing: 10 hours with power saving, 6 hours with LCD on. You are going to have an amazing experience with this baby monitor, as there is no feature on it that you will find useless or gimmicky. Even the extra lens feature is useful as the wide-angle lens allows you to have a full panoramic view of your baby’s room. There are physical buttons on parent unit but the display size is still big at 3.5 inches. Retractable antenna keeps signals strong while the LCD gives you a clear display. You can set volume levels, screen turn-off timers, voice activation options etc. to have full control over this monitor. Using the parent unit, you can pan, tilt and zoom. The camera unit lets you view at an angle of 270-degree horizontally and 120-degree vertically. Charging the batteries won’t be a hassle as with power saving mode your unit will work for 10 hours straight. What Makes Infant Optics DXR-8 So Much Better Than Its Competitors? While other baby monitors have at least one feature that sets them apart from the bunch, this amazing piece of equipment has dozens of features that make it a better purchase than most other baby monitor on the market. Interchangeable lens feature is the cool factor about it. A regular lens comes with the unit but you can buy a wide angle and zoom lens to increase the functionality of your baby monitor. The wide-angle lens gives you a panoramic view of the room whereas the zoom lens gives you a close-up shot of your baby – no deceptive software work involved there. The big display shows you a clear picture of your baby using the invisible IR night vision feature. If you think your baby is being discomforted, just use the two-way talking feature and comfort your baby with your voice. Temperature display shows clearly on your parent monitor screen so you know when you need to go to your baby and fix the temperature. Using the power saving mode, you can set the screen to turn off after a few set minutes but you can continue to monitor your baby with sounds. The best thing is that there is an arrow of LEDs on the parent unit that shows you how loud your baby is crying even when you have turned the volume down. You can add up to 4 cameras to the system and you will never even have to go through the hassle of installation due to the plug & play nature of the unit. Infant Optics even makes charging the unit a breeze by sending you a USB cable. You can use your laptop to charge the monitor. If beeping warnings for low battery and out-of-range unit bother you, use the software features to turn them off. One of the customers bought Infant Optics DXR-8 after trying out 5 other baby monitors from different brands. After being disappointed by the battery life the customer moved to Infant Optics and was compelled to give the product a excellent rating . Another customer showed great liking for the product by saying that she cannot live without it. This same customer also loved the product for having two-way talking feature and a stand on the parent unit. You will not buy this particular baby monitor for its cheap price but for the great functions it offers. Night vision, clear big display, two-way communication, interchangeable lenses, temperature display, expandability etc. are the features that you will actually buy this product for. You will be glad to know that thousands of customers have reviewed this product and given it an impressive rating. When compared with other baby monitors on the market, this is not the cheapest. However, this baby monitor is definitely one of the most feature-rich baby monitors. Interchangeable lens is a great add-on and long battery life is what most parents love about it. Go for this one because there is no excuse for not buying it.